Just how important is the quality of a steel rivet? Quite important, as it turns out. In fact, it is now believed that the rivets used in the construction of the doomed Titanic could have been at least partially responsible for the ship's sinking. While regular steel rivets may suffice for some applications, there can be many instances in which you need a rivet of a specific diameter, length, and/or constructed with a specific type of head. When that is the case, custom steel rivets can be an excellent solution. Custom steel rivets are a type of permanent mechanical fastener comprised of a head on one end of the shaft and a smooth cylindrical shaft. It must be noted that steel rivets can be manufactured using either high- or low-carbon steel. Steel rivets can be categorized based on their formability, hardness, and strength. Steel is created by joining carbon and iron, but it is important to note that there are various methods for alloying steel. This can be done by changing the amount of carbon and iron, as well as through the addition of metals, such as zinc or nickel. In the process of selecting steel for a custom steel rivet, it is important to consider the amount of heat the rivet must endure as well as how tough and durable the steel rivet will need to be based on the relevant application. It's important to note that some types of steel simply are not compatible with other types of steel. If the relevant application involves a type of steel that is sensitive, it's usually a good idea to select a different type of alloy for the custom rivet you plan to order. The end of the rivet located opposite the head is referred to as the buck tail. Upon installation, the rivet is inserted into pre-drilled holes. The buck tail end of the rivet is upset so that it is able to expand up to 150 percent of the original diameter of the shaft. This is done in order to hold the rivet securely in place. At Universal Rivet, we take great pride in offering the highest quality custom steel rivets. 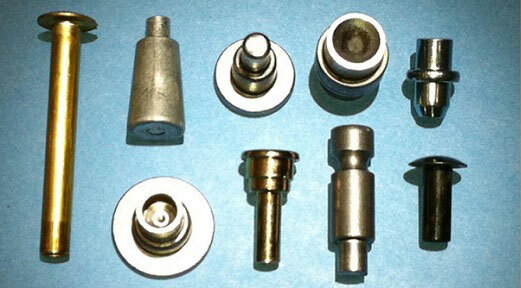 We are able to produce custom rivets in various diameters and lengths.